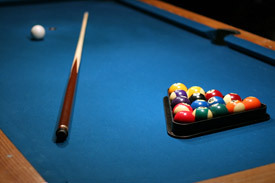 Challenge a friend to a game of pool in our licensed lounge areas or watch your favourite sport on the big screen! Only $2.00 per game of pool! Arcade games include pinball, Sega Super GT Racers, Big Buck Hunter, etc. They accept loonies and quarters depending on the specific game.